Learning the value of money is something all of us learn during our lifetime, at least for our own currency anyway. Spud is getting more older now, and although he knows the basics in maths like the simple addition sums, he doesn't have any clue about money. I am not sure of the right time we should start teaching our children about money, but I think now at the age of 7 and due to start junior school this week, I should teach Spud about the value's of money. Learning Resources very kindly sent us a game perfect for this purpose, and perfect to be included in my back to school feature. Money is effectively used with a form of counting, to ensure we pay the right amount for something we have brought, we pay the exact amount or higher, we need to subtract to know the figure of change we would receive. When using money, which is what most of us do on a daily basis, effectively, we are counting. Counting is learnt in maths and this is a great little game for math's fans, children needing help with maths, or for teaching your child about the values of money. Let me introduce you to Money Bags. 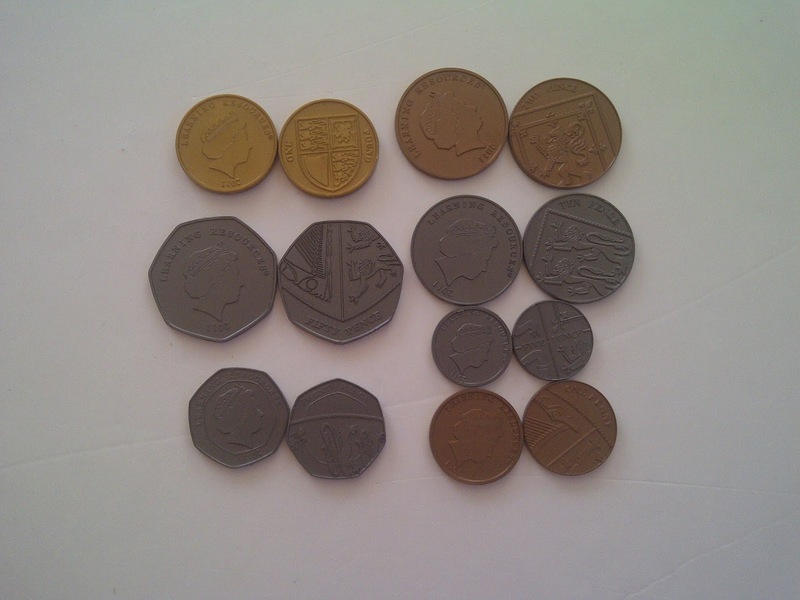 The game has a range of coins from 1p to £1, no notes are included in the game but the amount of coins can add up to more than £1, teaching your child higher values of more than £1. In the game you receive a game board, a spinner, 4 character counters, a range of plastic coins from 1p to £1 and instructions. 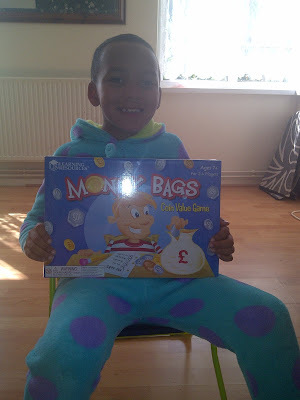 The game is suitable for ages 7-11 and can be played with 2-4 players. With Spud being a only child, I took this upon me to play the game along with Spud. The idea of the game is to be the player who gets to the finishing line first, with the player having the most money being crowned the winner. Each player selects a character and starts off on the starting line, players take it in turn to each throw the die, with the number of spots on the die, the player moves forward the selected number of spaces. Each space on the board has either a household chore with a figure (for example, do the laundry 44p), a £1 sign, or a bank exchange sign. 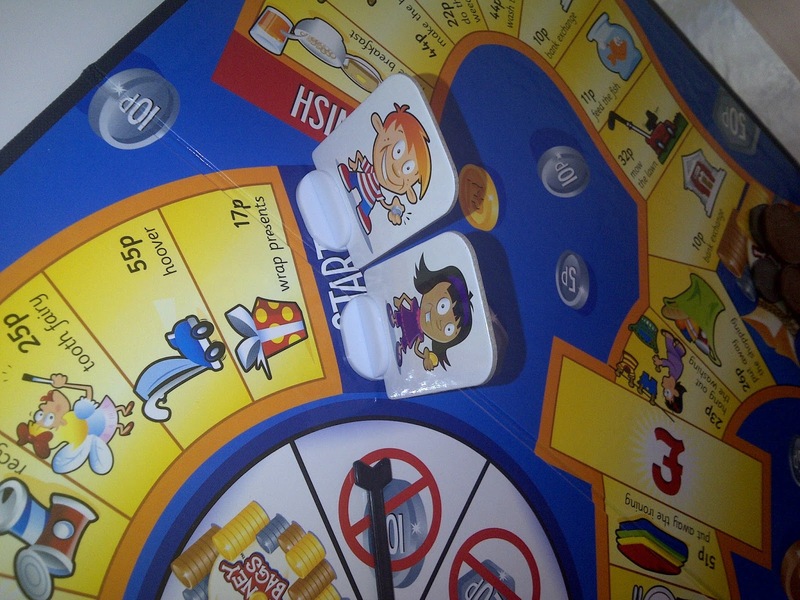 Once the player lands on their space, they have to use the spinner. The spinner has a number of different options, for example a player can land on a spot which has do the dishes 53p, and when the player spins the spinner, they can land on a sign that says NO 2ps, so the player has to take 53p from the bank without using 2ps, you could pick up a 50 pence coin, and three 1 pence coins to get your selected amount. The game is educational, challenging and rewarding. The game has not made Spud totally aware of money sense over night, but it has sure helped him. 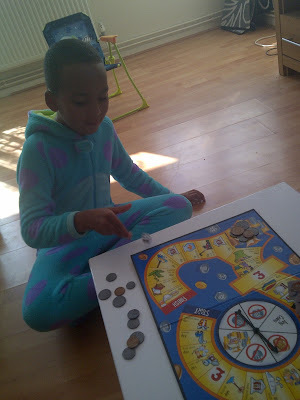 I am continuing to play the game with Spud at least twice a week, continuing to help him learn about money! 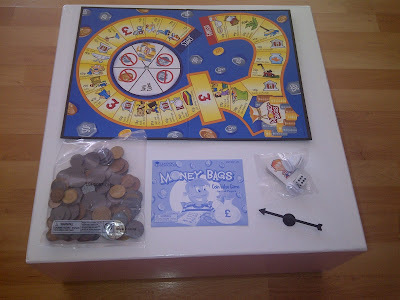 Money Bags is available to buy for £17.94 from Learning Resources, Amazon and small independent toy shops. Learning Resources, The Brand Teachers Trust, has a fantastic range of educational products online. To check out their fantastic educational products and toys, check out the official website here, find them on Facebook here or follow them on Twitter here.